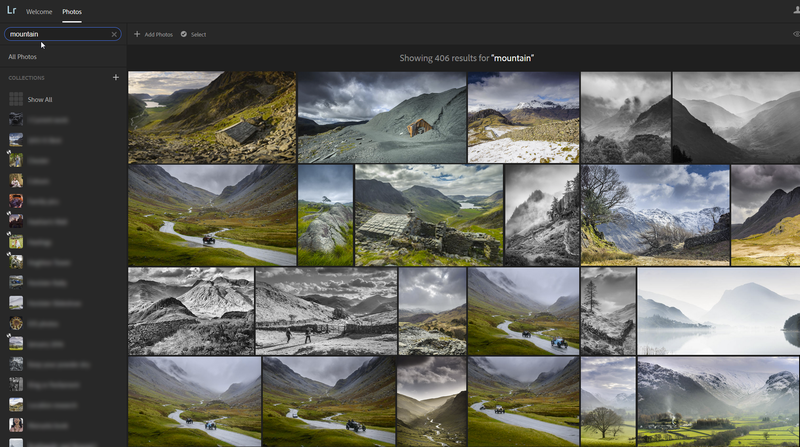 To access search, launch Lightroom on the web, and log in. Then, click on the Lr menu in the top left to open the menu and select Technology Preview. 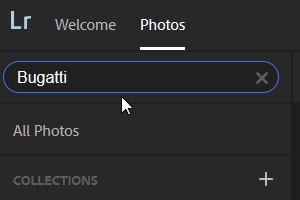 Toggling Search on will start indexing your photos, which makes it possible for you to search through your photos…. The functionality will also grow and improve before we release it, adding in the ability to search through an image’s metadata and more, making the search even more powerful and able to find a specific image precisely. Try searching your library for things like food, temples, flowers, animals, and more. To enable it, follow the instructions above. Note that the slider next to “Search” isn’t a bit of decoration as I thought at first. It’s what they mean by “Toggling Search”, so you drag it to the right to enable the feature. Then Apply Changes and you should have the Search box. 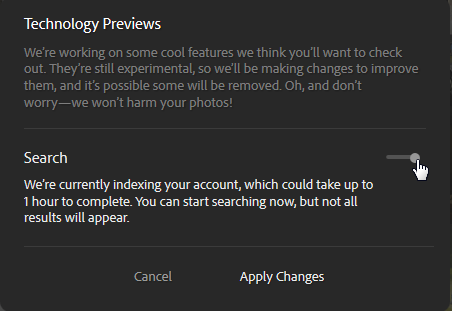 It’ll take a while to index your photos and my guess is that this will vary depending on how much you’ve uploaded. I’ve about 2000 photos and it took 20 minutes to go live. It obviously uses metadata for searching, but it also uses recognition techniques. With “Bugatti” it scored 100%, probably as the pics are captioned and keyworded, but with “sheep” 6 of the 9 were right. Of course, one doesn’t know which images were missed. One tip is to search for singular nouns, not plural ones. “Cars” only found 5 photos, while “car” found plenty more. Searching for “women” worked pretty well too, even detecting photos of women which had no related keywords. Unfortunately it also picked up some long-haired guys and some bearded blokes in kilts! Adobe had better not launch it in Scotland, if they “ken” what’s good for them. Here I tried a vague term “mountain” that probably isn’t anywhere in the metadata, and I’d say it did a reasonably-good job of finding matching images. So it’s interesting technology, and pretty useful for a preview. At least Adobe found the Bugatti. Stunning photos.